One of the most exciting recent developments in Formula One is the reappearance of drivers driving in other series. For some reason—an unwillingness to risk getting hurt or break their focus or whatever—that hasn’t happened much recently. 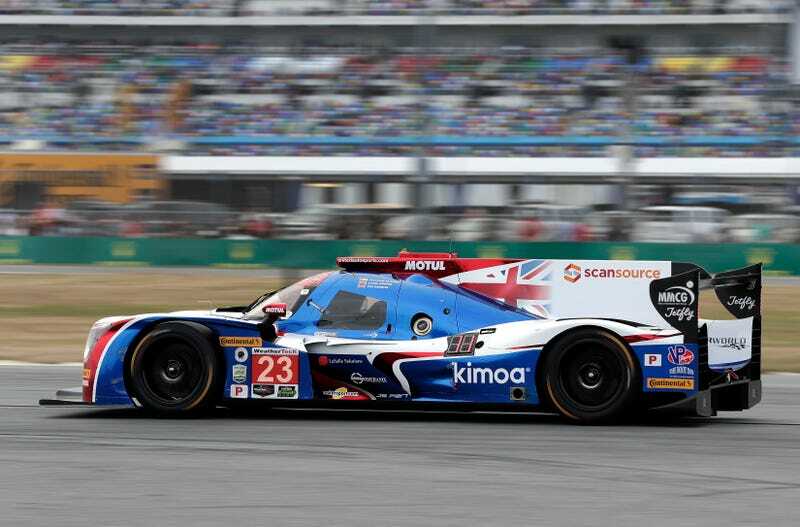 But as F1's Fernando Alonso and Lance Stroll have found out at this year’s Rolex 24, the world of endurance racing can be brutal. McLaren F1's Alonso signed on to race with the No. 23 United Autosports team, which is owned by McLaren F1 exec Zak Brown. The No. 23, like many of the other prototypes, has had a genuinely rough race. Brown was realistic about his team’s chances before the Rolex 24, telling the pressroom that he expected a podium finish at best for his cars because the competition was so stiff in the thick 20-car Prototype field. Yet that could only happen if the Nos. 23 and 32 executed a near-flawless race, which hasn’t happened for either car. Alonso’s getting a trial by fire (figurative fire, not Mazda Team Joest fire) in his first-ever 24-hour race. They, too, had a tire go down with Phil Hanson behdin the wheel that damaged the bodywork of the No. 23 car, which cost them time spent off-track to repair the car. Shortly afterwards, a brake master cylinder failure forced them back into the garage for more repairs, losing around 40 more minutes off-track. Alonso rather comically kept going around the big NASCAR oval when it failed, but fortunately was able to bring the car back into the pits. Thing is, he seems to be having fun. He sometimes cranked out the fastest laps on track. While handlers have been quick to move him through throngs of fans—excited masses who have helped push Daytona’s attendance numbers to a possible record for recent years’ attendance—he seems glad to be here, smiling for fans and stopping for the occasional autograph. Even his update in the last four hours of the race on the car’s likely lower finish seemed disappointed, but still excited to be trying something new. Alonso isn’t the only Formula One driver in the mix this weekend. Williams F1 driver Lance Stroll is here for his second attempt at the 24 Hours of Daytona, and his first as a F1 driver. His No. 37 Jackie Chan DC Racing LMP2 effort has fared slightly better but couldn’t escape the phenomenon of Prototype-class cars popping tires. They lost time in the garage to repair the rear end of their car after the race’s midpoint, dropping them down the standings. They currently sit in eleventh place with two hours and forty-five minutes left. There’s even a promising F1 test driver in the mix, driving alongside Alonso in the No. 23. McLaren test driver Lando Norris has been cranking out wicked fast laps when their car has been on track as well. Here’s hoping those dudes are teammates in multiple series more often. The No. 23 currently sits 12th in the Prototype class, even despite all the setbacks. Rain is returning to the track, though, so maybe these guys have a shot after all.